Full size luxury sedans have become more and more popular across the country and across the globe. Most believe that it has to do with the increased performance features in these vehicles. Consumers are able to get the same performance out of a smaller vehicle. 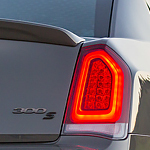 That is why we here at L & M Motors located right in Athens are so excited to announce the arrival of the all new 2019 Chrysler 300. The Chrysler 300 includes an advanced all-wheel drive system which allows drivers to take on any terrain in almost any weather conditions. Not only will your family be safer, but your car will also perform better. Finally, drivers will love the available 5.7 liter V8 engine. This motor can kick out up to 363 horsepower and 394 lb.ft. of torque. Both of these figures represent best in class performance for full size luxury sedans giving consumers an even bigger incentive to switch.